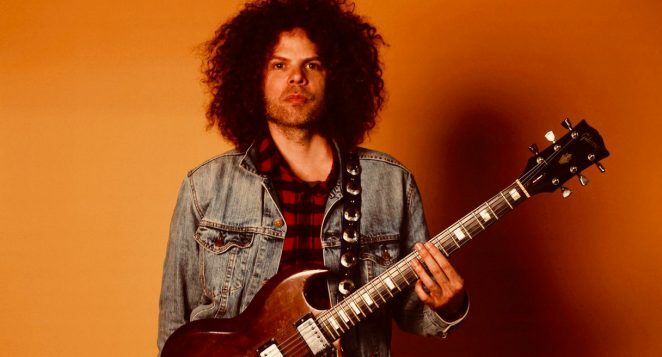 In between USA jaunts, Wolfmother’s Andrew Stockdale is currently on tour in Australia hawking his fabulous new album Slipstream, playing Northcote Social Club in Melbourne tomorrow night, followed by gigs in Sydney, Brisbane and Byron Bay. Slipstream is Andrew’s first solo release since his 2013 debut Keep Moving. The Victorious album was also released in 2016 under the Wolfmother moniker . During the creative the process of putting Slipstream together, Stockdale put his usual pre-production methods into practice thinking a Wolfmother album would be the end result. However somewhere along the line he had a change of heart. Once Stockdale had made the decision to release the album under his own name, it seems the project took on a life of its own and he just ran with it. While there are some obvious heavy Wolfmother-style riffs to be found on the album, Stockdale taps deep into his inner-teen record collection and presents us with nods and winks to all kinds of classic rock influences. Think TMG, The Faces, T-Rex with the electric tracks and there’s certainly a Zeppelin flavour to the delicate acoustic tunes such as Cherry Lane and Dreamy Afternoon. For the album and American tour as well, Stockdale utilised the services of some musicians he’d never worked with before. “A lot of artistic choices were made on availability and it was really interesting to see who I would meet as a consequence. For example, the alto-sax player turned out to be an attorney and offered to help out getting a record deal, which I didn’t follow up but it just shows that when you’re open to spontaneity some interesting opportunities may arise. With that flexibility in the studio which has always been there to an extent with recordings, why not translate that into the touring forum. The industry has a long standing tactic for success which is same band members, manager, label, producers, though there’s something to be said for keeping it fresh and chasing inspiration and that’s what I was pursuing on this record. Means of distribution are changing, means of recording are changing. Don’t miss this unique opportunity to catch an internationally acclaimed, Australian singer, songwriter this week.